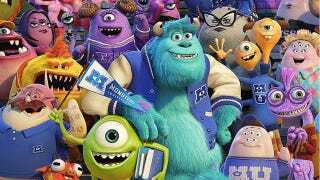 The latest trailer for Monsters University has (by far) the most footage from the actual movie — including a few clips from Helen Mirren's monster Dean, and a shot of Nathan Fillion as an obnoxious jock monster. It took us forever to place that infamous surly voice when we first saw the film, but now it's unmistakeable, and a welcome surprise. Monsters University hits theaters on June 21st.